When you are thinking about adding a more exhilarating atmosphere around your property, building a patio should be a top answer. 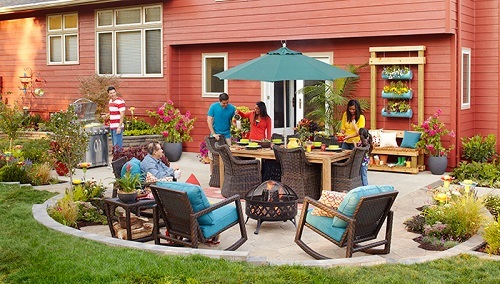 By having such outdoor living space, you can enjoy the spare times in a more fun way every time. Even more, a patio is like a must-have addition to every house nowadays. It is so understandable since it provides many benefits for the homeowner. A patio will surely enhance the beauty of your home too. With thousands of mesmerizing designs, you can always choose the one that will bring the style of your property to a whole new level. One of the most popular patio design which is chosen by many homeowners today is the round one with the firepit in the center of it. The size of this kind of patio is quite small, yet still provides a very joyful nuance perfectly. Here, we have some gorgeous DIY small round patio with fire pit ideas that will definitely inspire you to build one in your own home. Some are very easy to build just by yourself but the others may need a professional contractor’s help. This one is actually not a real patio but surely provides a space to enjoy your backyard in a more fun way. You surely won’t need to do lots of efforts to build this patio. The frame-like construction of this patio is all made of the wood which is finished in black. Then, to create such base, you just need to draw a circle then pour the gravels. 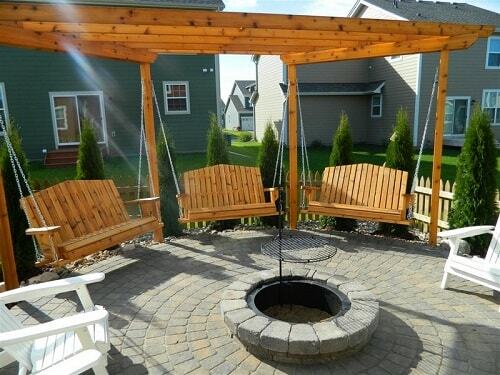 The swing is easy to make too, you can use the shipping wood pallets as the materials. They are easily available and so cheap, even you can get them for free. 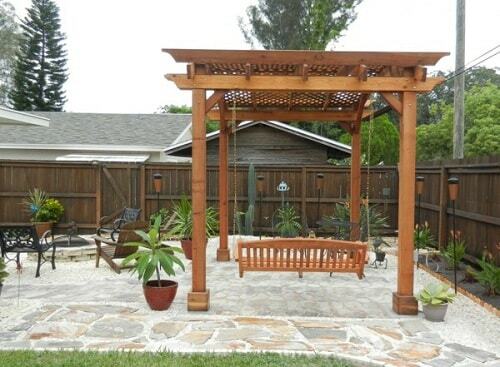 A nice-looking round patio with block base and the built-in pergola-like shade. The three swings then hung onto the shade to provide a more joyful atmosphere. 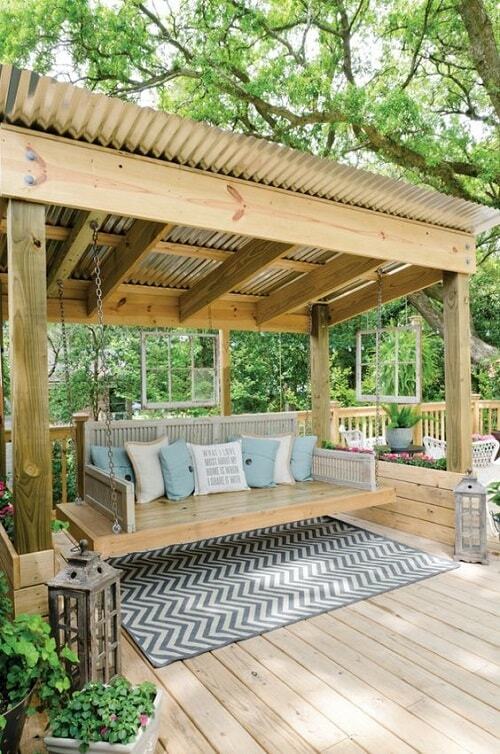 This DIY small round patio is designed in a rustic look in which the base, pergola, and swings are kept in their natural look. It’s surely a good idea to make your outdoor living space look beautifully minimalist. 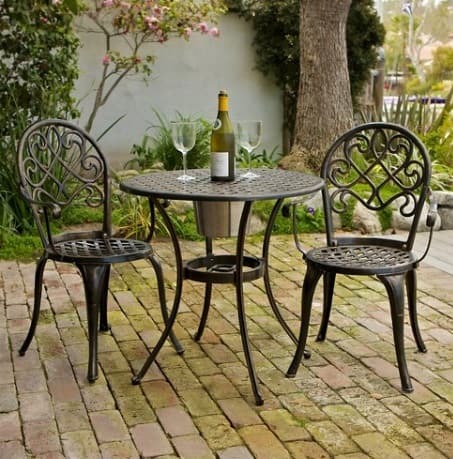 The white chairs in classic style are just perfect to complete the look and function of this patio. An effortless DIY small round patio always sounds good since you can make it instantly and cheaply. This one is surely a perfect choice for you who are looking such patio. Again, this one is not an actual patio but just a grassy backyard with the particular area which provides more attraction. 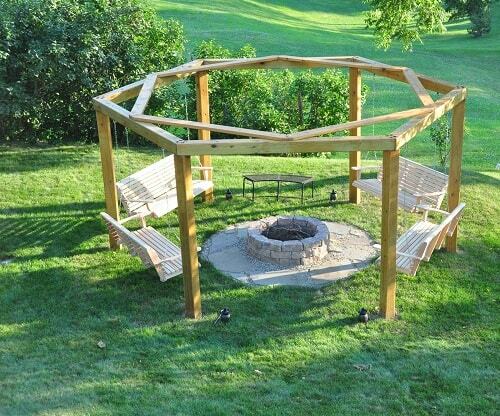 The small firepit is built in the middle of the area, surrounded by the wood frame with swings. The wood frame is built in octagonal design which looks so adorable. It’s left unstained to keep its natural look which matches well with the surrounding. This one is a gorgeous white patio with the vintage furniture in the natural brown finish. 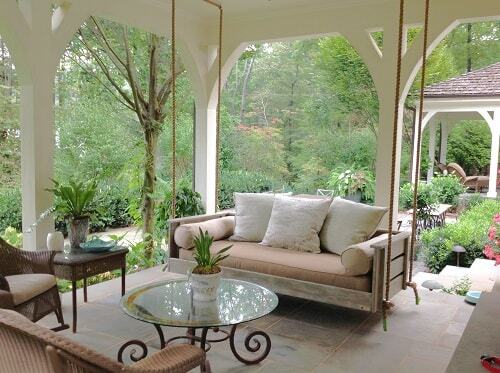 For sure, the swing becomes the focal point here since it’s built inA�huge size. The firepit is the portable one which is made of steel, adding the rustic industrial touch to this patio’s overall look. Then, the greeneries and flowers make it look and feel way more inviting. A round patio or commonly called deck is a nice option when you think concrete or block don’t work well for you. Here, the deck is built in a round shape which is so adorable and comfortable to enjoy. The swing in boho style is added which enhances its overall look. The rustic rope and unfinished chair are paired with vibrant red upholstery and decorative accent pillows, creating a simply fashionable look. As you can see, the hanging lantern in vintage style completes the patio perfectly. Such an inspiring DIY small round patio ideas to try. Having a large backyard can be so beneficial when you have a plan to build a patio there. You can have a superbly maximum enjoyment with lots friends or family members. This one is surely a great huge patio which is built in a much simpler design but still provides great attraction. The swing is also builtA�in large size with the pergola shade in lattice style, becoming the main attraction of this patio. Furthermore, the swing is installed in the particular area of this patio which is separated from the dining area with the small fire pit. The base of the patio with stony look matches the fence and the greeneries around. This stunning patio will surely inspire you to build the similar one on your property. The design is so elegantly mesmerizing with its furniture and accessories choice. The dark brown tile in rustic style is chosen to become the base of this patio. 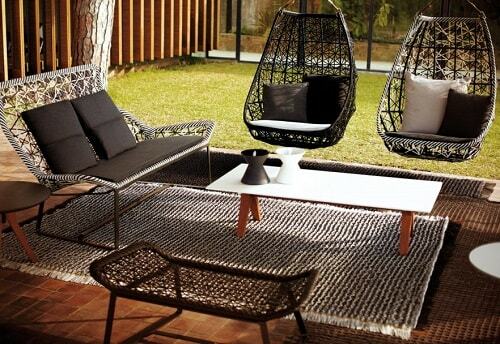 Then, the contemporary patio furniture and accessories in lattice look decorate it very well. There are two swings which are secured to the big tree near the patio. Those egg-shaped swings even make this patio look way more attractive. As you may have noticed, what’s catchy about this patio design is its furniture style and color choices which are totally worth to copy. A patio which is directly connected to the house is always a smart way to make it more exhilarating. It provides easier access for you to use the patio anytime. Here, a DIY small round patio is built close to the back door. The base of the patio area is decorated with the rustic gray block, creating a separated look. 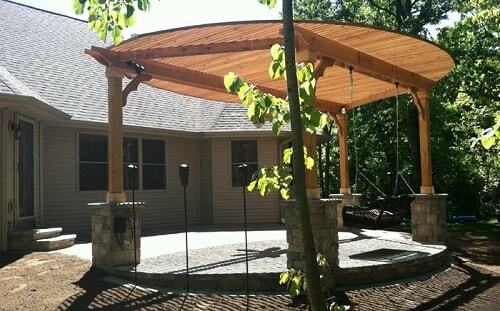 You can see that the patio is covered with a round shade made of wood lumber in natural finish. Then, a black steel swing is installed, giving a nice elegant touch to the overall look of this DIY small round patio. 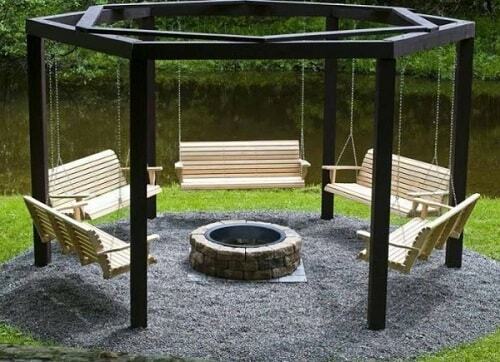 If you are looking for an outdoor living space with huge fun swing, this idea is totally worth to try. 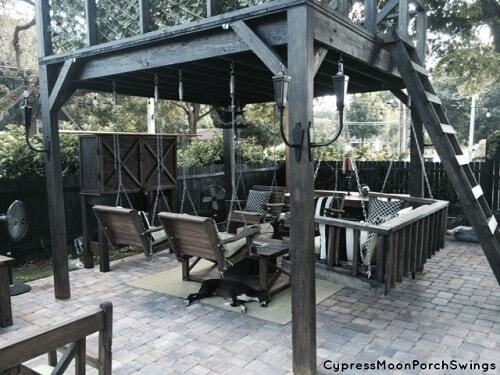 A wooden patio with a huge trampoline swing that will make the time feels more exhilarating. You may need a bigger patio if you want to add some outdoor chairs and tables on. 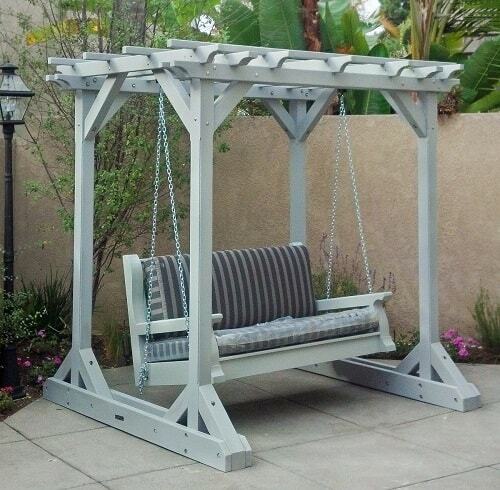 But for sure, this kind of swing will add not only maximum enjoyment but also distinctive look to your patio. 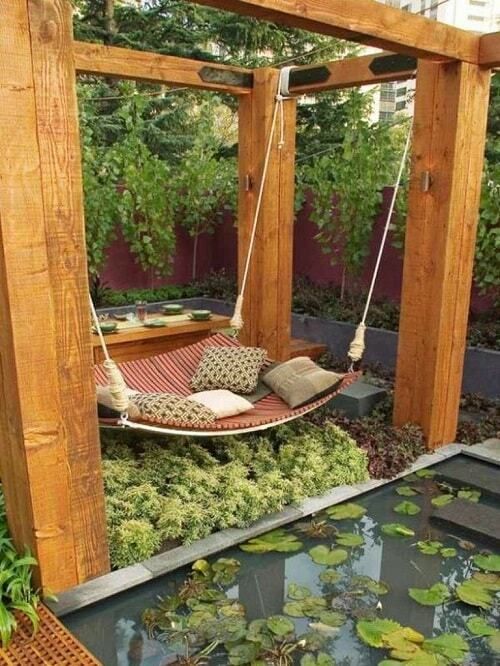 Adding a swing bed is surely a much better idea than choosing a chair one. You can relax or even sleep on in the midst of the cool spring or summer breeze. Here, the bed swing’s frame is made of the used shipping wood pallet, so you can create one at your home easily and cheaply. The bed is covered with the vibrant colorful fabric which creates a nice contrasting look to the overall look of this patio. This is kind of covered patio which uses the simple construction with lots of greeneries around to keep the air feels refreshing. Building a pond next to the patio is definitely a good idea. It will add a superbly fun and fresh atmosphere to your outdoor living space. This unique patio is a nice example for you who need an ultimate inspiration to build such design. There’s a small simple patio, cozy boho swing, and a minimalist pond built close to each other. You can see the greeneries under the swing which makes it wonderfully catchy. When you have a plan to add a swing bed to your outdoor living space, the thing that you have to think about is the cover. 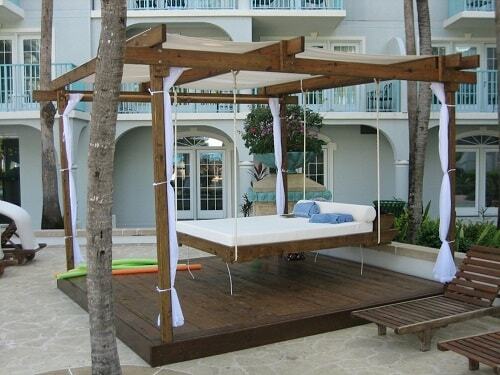 You can’t have a swing bed without a cover since it will not provide you great relaxing time. 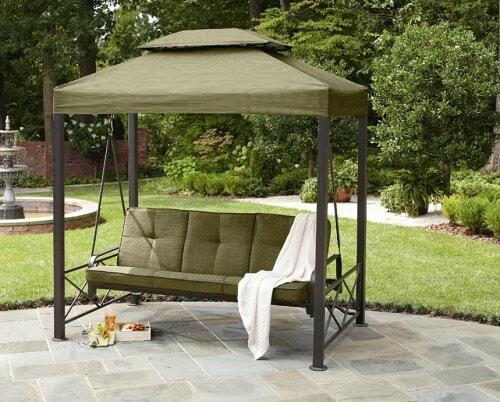 Here, the simple yet gorgeous swing bed is installed inside a canopy. The construction is all made of wood with the fabric cover and reversible curtain. 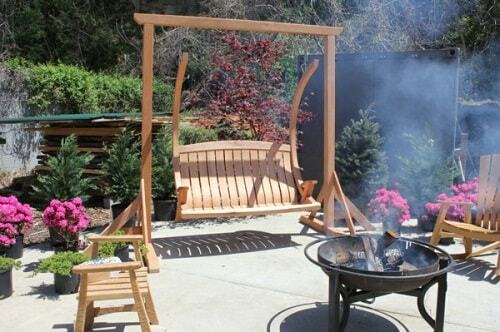 For sure, the design of his swing bed is very tempting to try to enhance the attraction of your outdoor living space. 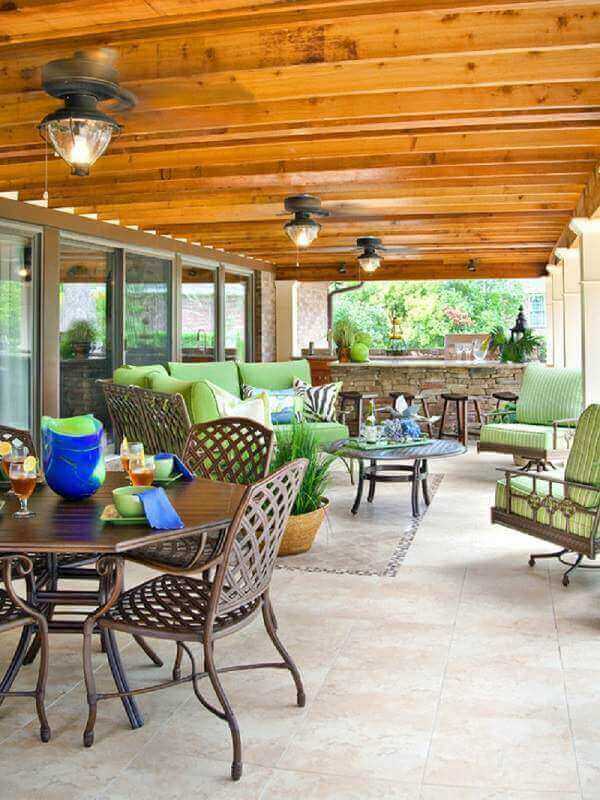 A mesmerizing covered patio in bright earthy color combination that will give a classic elegant touch to your property. The mixture of brown, beige, and white of this patio design is absolutely admirable. The rattan chairs and a round steel table with glass top are placed to provide the spot to enjoy a nice chitchat time while enjoying some coffee and snack. 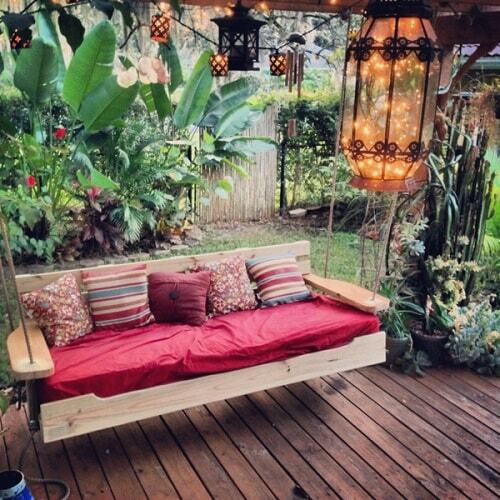 Then, the sofa swing with the wooden frame is added to enhance the attraction of this patio. You can see the style of the swing sofa which is inspired by the farmhouse look, really matches the greeneries around this outdoor living space. This is a simple round patio with the rustic gray block base and grass liner. It’s actually a good idea to have a neutral-colored patio when you have a grassy backyard to create a relaxing yet contrasting look. The green swing sofa with the built-in canopy then added to this patio. It creates a more beautiful touch while also provide more spot to enjoy the space. 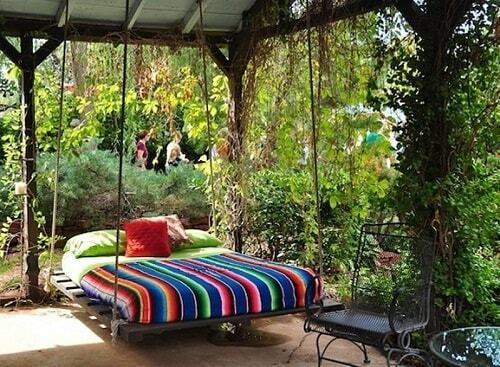 The color of the swing matches the surrounding of this backyard beautifully. Such an inspiring layout that is worth to try. Grey is a gorgeous neutral color which always relates to the minimalist style. 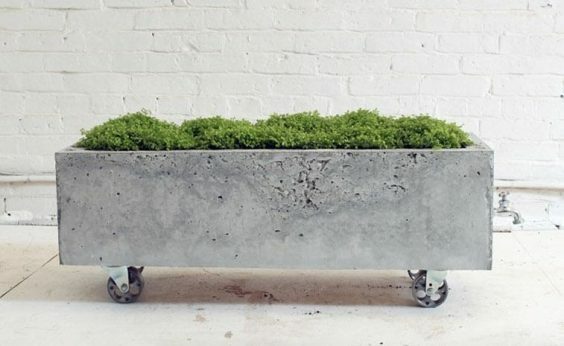 Therefore, if you want to have such touch in your outdoor living space, choosing grey is always a great decision. Here, a swing sofa with light gray frame and a deep striped gray upholstery looks so nice to decorate a simple patio with large earthy tile. The greeneries around create a more colorful look which is so adorable. 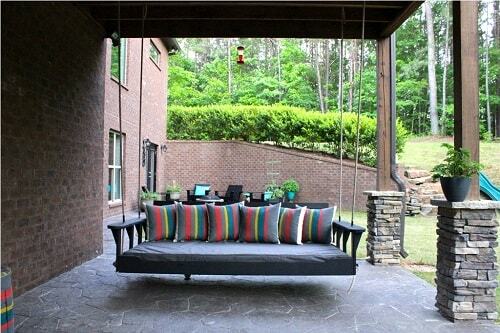 Having this swing sofa on your patio will brighten up and relax the atmosphere around beautifully. A patio is surely enjoyable day and night, especially when the weather is good. Of course, a patio which is full of light will look and feel so inviting when the sun has gone. 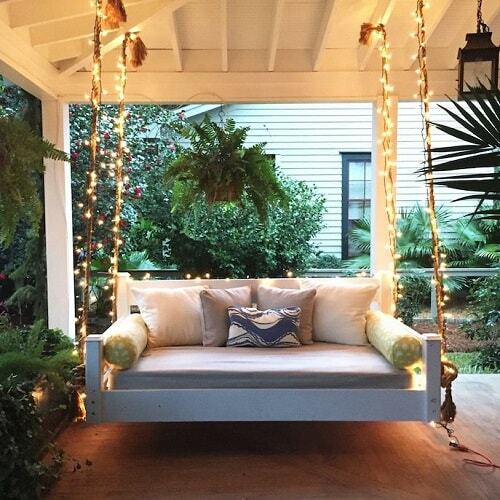 This swing sofa which is installed in a small covered patio is equipped with the string light on its ropes. The swing will look so catchy in the night with its light. The frame is finished in white which is beautifully paired with the white upholstery and throw pillows. It makes the lighten rope become the main attention of the swing’s overall design. This is an elegant patio with black tiles and swing sofa which is so inspiring. The patio is built under the cover right in the back of the house. The posts of the cover are made of the wood with the rocky base which looks gorgeously earthy. The overall look of the patio is rustic, matches well the design of the house. To create a more colorful look, some grey accent pillows with colorful stripes complete this swing sofa. 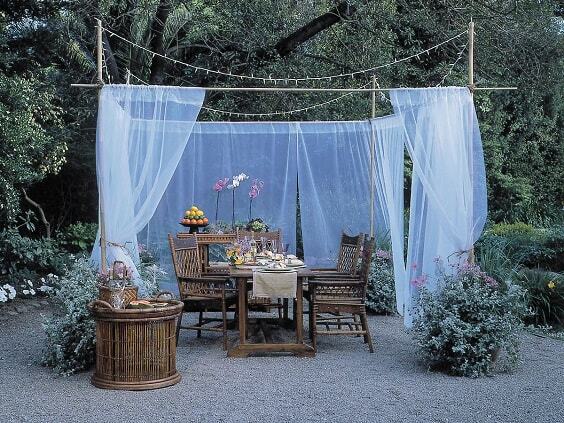 For sure, you can simply try this idea for your own patio. A DIY small round patio which looks so adorable with the natural brick look. The formation of the tile is so catchy to make the overall look of this patio more attractive. 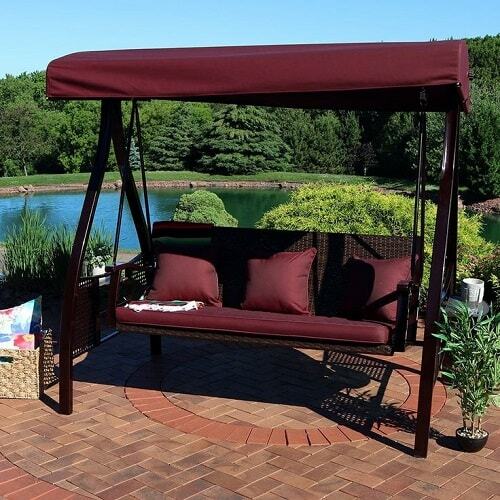 Then, the maroon swing sofa with the built-in canopy is placed on this patio. The design flows beautifully with the look of this DIY small round patio. The patio is surrounded by the greeneries which enhance its beauty and comfortability at the same time. 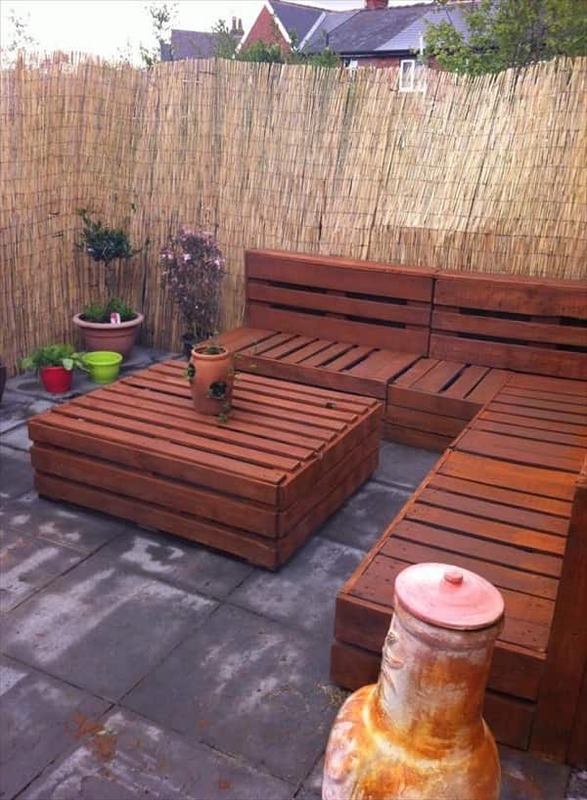 A superbly attractive DIY small patio with an amazing construction which provides maximum enjoyment for all the coming guests. Not only the furniture, this patio is built with complete attraction. First, this patio is covered with the wooden construction that provides additional outdoor space on its top. In other words, this is a two-level patio which will bring your outdoor living space to a whole new level. Then, all the chairs and sofa is made of wood which is designed in swing style. The guests will sit joyfully while enjoying the fun time on your patio. The base of the brick is made of the earthy grey block which creates the industrial touch to the this patio’s overall look. There are lots of patio swing with the built-in canopy which is offered in various sizes. You can always choose the one that suits your taste. 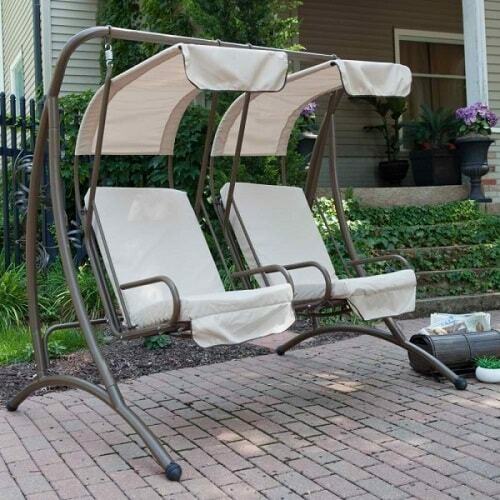 This one is patio swing with double seat design and built-in canopies. The color looks simply adorable in cream and grey. The swing is placed on the simple patio with the natural gray block. For sure, you can enjoy the swing peacefully with your loved one. If a regular swing, swing sofa, or even swing bed don’t work for you, then a swing lounge may suit your needs. 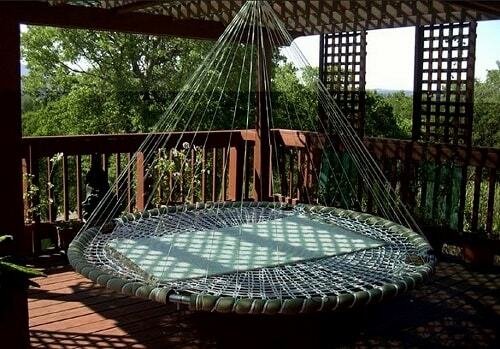 It gives you a nice spot to relax your body while swinging cozily. 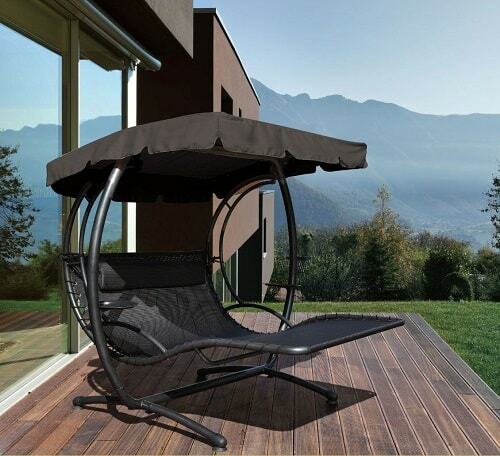 Here, a black swing lounge with a built-in canopy which looks so elegant is placed on an above ground deck. The minimalist nuance is sparked out by the combination of the swing lounge design and the wood finish. You can copy this idea easily when you have a plan to build a minimalist patio in your home. This one is a beautiful deck with the natural light brown finish that looks naturally inviting. The swing with the covered is installed to enhance its attraction. The construction of the swing shade is made of the wood log with the steel top. It creates a unique creative look which will become a central attention of your outdoor living space. 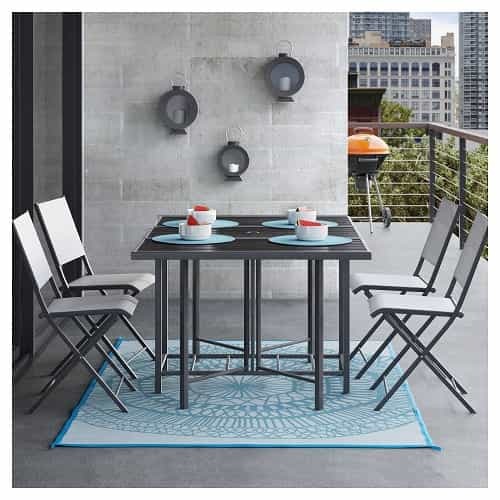 Then, a black and white rug with chevron pattern is placed right underneath the swing, giving a beautiful boho touch to the patio. It’s totally a worth to try patio design that should be included on your top list. So those are some best DIY small round patio with swing ideas that we have picked especially for you. You can choose the one that suits your style and save it for later when you a plan to do some improvement in your beloved home. A small round patio is always a great solution for you who have a narrow backyard. 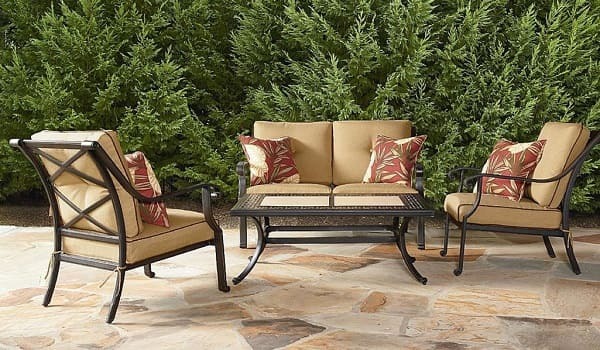 With the proper furniture and accessories, this kind of patio will still provide great enjoyment for you as the homeowners and all the coming guests. 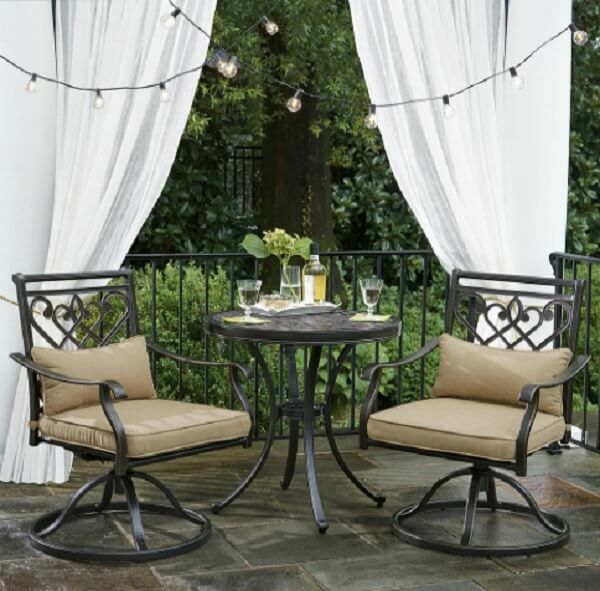 Besides those outdoor dining or bistro sets, a swing will surely enhance the fun of every outdoor living space. Imagine reading a book while enjoying the pampering sensation of the swing accompanied by the fresh outdoor air. Sounds tempting? Obviously! 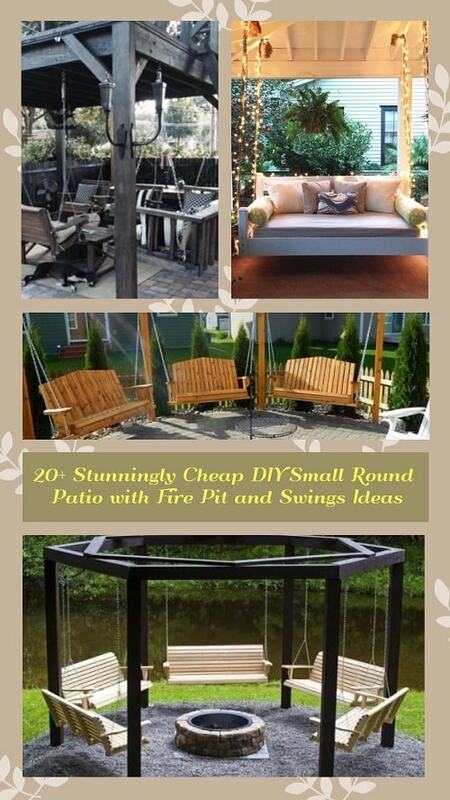 So have a fun time to build your own DIY small round patio with swing project!